The day a customer chooses to purchase education from your real estate school for the first time is a monumental day in your relationship with them. In the retail world, that transaction makes them a customer. But for you, they transform into something much more powerful on that day…they become your student. Actual statistics vary, but it’s widely known that it costs significantly more to acquire a new customer than retain current customers. The same goes for students. In real estate education, every prelicensing student is a postlicensing or CE student waiting to happen. They will have an ongoing need for the education you provide as long as they keep their license. But with a year or more between license renewal deadlines, how do you build a relationship that keeps students engaged between seasons? There’s a three-tiered approach you can apply immediately to keep students coming back to your school beyond their initial licensing education. It’s extremely affordable and will go a long way toward minimizing the risk that comes with relying solely on new students to fill your classrooms. The product is the centerpiece and the cornerstone of success for your real estate school. You can market or sell your way into a relationship with students, but if the product isn’t good, there’s no amount of marketing and sales that can make up for it long-term. 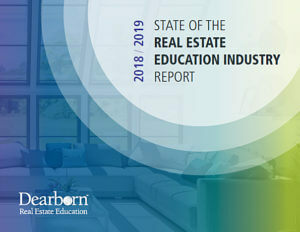 In real estate education, your product is the student experience. The first thing you can do to ensure that students come back to fulfill future needs is to deliver exceptional education, in a conducive environment, with great instructors and support staff. Take a look at your school’s educational experience from a student perspective. Are you delivering the kind of product that would leave a positive lasting impression? If so, you’ve already done the most important work in your student retention plan. If not, you now know where to start. One mistake real estate schools often make is only talking to students when they have something to sell them. But in real estate education, there can be some sizable gaps between purchases. You’re leaving a lot up to chance in that one-, two-, or three-year window if you only contact students when they’re up for renewal. You already have a reputation as an education provider to your students. Capitalize on that by continuing to provide education that adds value to their career even after they’ve left your classroom. Offer quarterly webinars or in-person lunch and learn events. Find experts on specific real estate topics to write articles your students would find valuable. Create a monthly newsletter featuring these resources. There are many different tools you can use to keep up communication and maintain a long-term relationship outside the sales cycle. Experiment, and then pick one or two that seem to work well for you and your students. Legally, you already have the right to stay in touch with your students if they haven’t opted out of communication from you. But that doesn’t mean they’re going to pay attention. People are bombarded with marketing messages, so getting them to pay attention to yours can be an uphill battle. Ultimately, you want students to come back and purchase education from you. The best way to ensure they do that is to dedicate yourself to providing them with valuable education and information even when you don’t have anything to gain. Become the go-to resource for your students as they build their career, and you will see the benefits on the bottom line. You’ll also see things like higher open and click through rates on emails, and better engagement on social media. These are indicators of a strong relationship of trust between you and your students that will lead to future enrollments.